Tulip Crispa or the fringed Tulips looked really good at our Spring show so I have planned to grow some next year. These photos were taken on the bench demonstrating what good cut flowers Tulips can be. 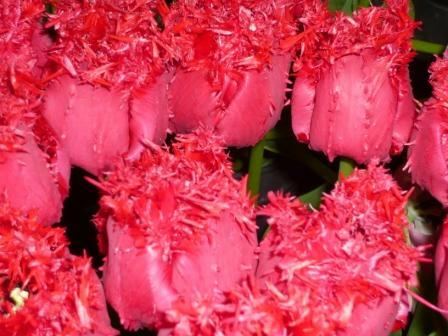 The fringed or lacerated petals are unusual yet elegant and add to the attraction of these strongly coloured flowers. 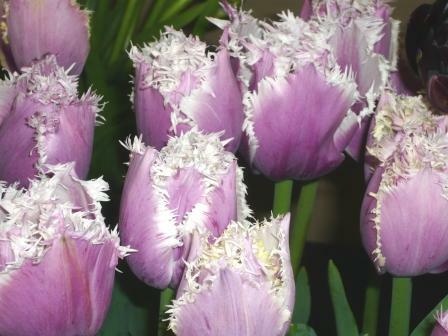 Fringed Tulips are still relatively new and now have a class of there own at shows No.7. Fringed Tulips flower early to late May at a height of just below 2 feet. Feed up the bulbs with a general fertilizer alternated with a high potash fertilizer as soon as flowering starts. Break off old flower heads as soon as possible. Fringed tulips look better as they age and the petals become more reflexed. 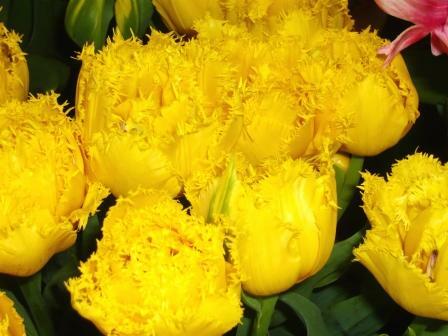 Flowers tend to be quite long lasting when compared to other tulip varieties. Davenport has a yellow fringe on what is otherwise a red flower and looks stunning. For simplicity and clarity the white Swans Wings is so well named I must try that.